There isn’t much my children can do that will make me truly angry. My oldest has broken three separate windows, all of my children have made their marks on the walls with crayon or marker, and all of them have had their moments of “mouthiness”. None of those things cause me to feel truly upset. Eh, they are kids and these things happen with kids. All of those actions have consequences in order for the children to learn from their mistakes. It is what it is and we move on. As calm as I can be when those discipline issues things occur, I can’t seem to keep my anxiety at bay when my children are in the midst of sibling rivalry. Nothing my children do makes me angrier, nothing makes me want to ground them for life, like sibling rivalry. I know I’m not alone in feeling this way. Sibling fighting brings out the mama bear in the oddest of ways. If one of my children is verbally or emotionally hurting another of my children, it’s a tough situation to navigate. Usually the offender is lashing out for some real or perceived slight, which was administered by the sibling he is now slighting. I feel responsible for soothing the feelings of both parties because I care about them and their relationship with each other. It’s a difficult position to be in. 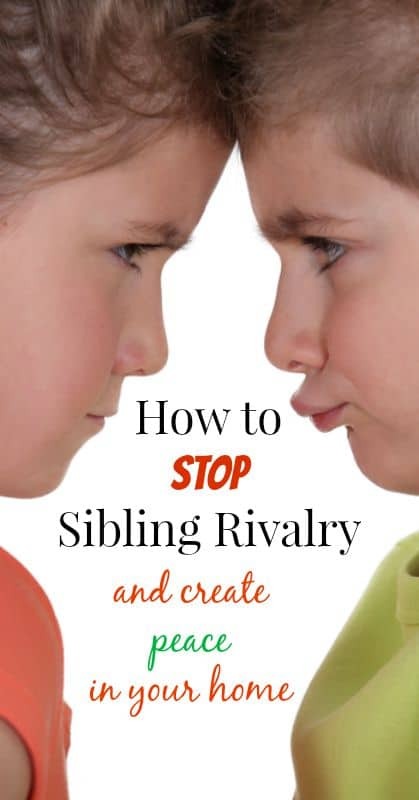 Of course I wouldn’t write this post if I didn’t have some tips for dealing with sibling rivalry, but I’m going to give you the bad news first. You can’t make it go away overnight and you can’t make it go away completely. It’s true. Anytime two or more people live closely together there are going to be conflicts. 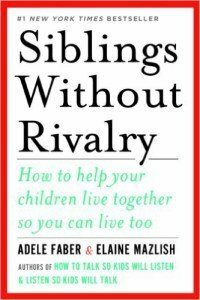 You will have to deal with sibling rivalry until they reach adulthood and finally get some space from each other and a desire to spend time with each other on their own terms. The goal is to teach them how to communicate their strong feelings toward each and to lay some ground rules for how they can show each other when they are upset with each other. 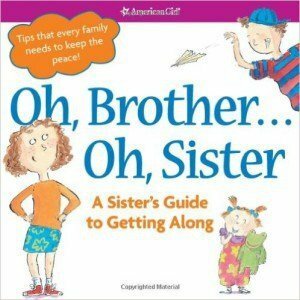 This will make your home a more peaceful place and it will keep sibling fighting to a minimum. If you’ve done it right, they will want to spend time together eventually. If you mess it up, Christmas will be a nightmare every year. Just sayin’. No pressure. At the time of this writing my boys are 16, 14 and 12. We experience very little sibling strife anymore. It really began to taper off around the time my youngest was 7, which I think is a magical age. As expected, personality plays a role in the amount of sibling fighting that goes on in any home and my oldest and youngest child (who both tend to be competitive by nature) struggled the most with sibling rivalry. My middle child, who is naturally a peaceful dude, has never started a fight with either of his brothers. He has abruptly ended a few by refusing to deal with their big feelings, though. 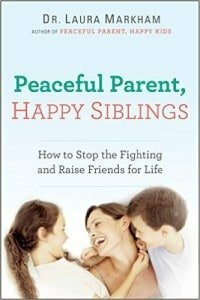 My husband and I worked hard in the early years to teach our boys peaceful, non-violent communication and to show them how to deal with their own feelings when they feel persecuted by their sibling. Even if you missed those early opportunities to model good communication and to teach your children how to cooperate with each other, there are still things you can do make your home a more peaceful place. Here are my best tips. If your children are at home all day because it’s summer/school break or because you home school, keep a structured routine going. Children who are bored are miserable and children who are miserable pick fights with each other. Make them long for a free moment to spend playing or watching TV together. Yes, this does mean more work for you. Take a deep breath.. It’s not forever. It’s less than 18 teeny, tiny years. Oh, wait. I said that already. Well, I mean it. Seriously. This is the key to making sibling rivalry go away. Make sure your children have their own space. Maybe your children have to share a bedroom and there is no way around it. Give them each time alone in that room each day. Set a timer. Let them relax in their own space for a while. When they know that they can expect this time to themselves when they don’t have to share their things and their space, it makes it easier for them to tolerate each other when they have to share. The point here is to hear both sides, but not give too much weight to either side. In life they will be involved in situations where they get the short end of the stick. It’s how they handle it when that happens and how willing they are to compromise that is important. Create situations where they have to work together to accomplish something that rewards them both. Having them clean a room together in exchange for a trip to the park or a treat is a great way to remind them that they are on the same team. I tied some yarn (loosely–this is not a punishment and it should not hurt. If it hurts them, you’re doing it wrong.) around their ankles and had them spend a couple of hours attached to each other. Team building, baby! Turns out they loved it and thought it was hilarious. But not hilarious enough to want to do it everyday. They have never forgotten that day and we’ve never had to do it again to emphasis to them that they can work together if they try. Don’t allow bullying. Allowing children to work out their own tiffs is one thing, but not stepping in when one child is being physically threatening or abusive (any type of physical contact in an argument is defined as abuse in this house.) is wrong. It is your responsibility to step in before things become that heated. Emotional bullying it not okay either. If someone is so upset that they let name calling slip from their lips, I take the victim to another room to get away. It is never okay to continue to engage with someone who is so out of control that they have resorted to physical or emotional strikes. If this does happen, an apology is expected before the original situation is worked out. If things are so intense that you children cannot and will not cooperate with each and make amends as needed, have everyone go to their separate corners until they have calmed down. There is no reason to force an apology from someone who is still too emotional to truly feel sorry. There is no reason to force cooperation from two or more people who are upset. Most situations can be left until later to remedy when everyone has a clear mind and a calm head. 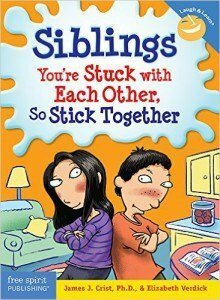 Check out my parenting Q & A on sibling rivalry.